Live Music Measures Up: An Economic Impact Analysis of Live Music in Ontario is the first comprehensive study of the live music industry in Ontario. The report provides critical data and information that will help guide decision-making within the sector, in government and other allied stakeholders. “This report provides a comprehensive picture of the benefits live music brings to Ontario. In fact, it only enhances our understanding of data collected in our 2012 economic impact study, and cements what we know about Ontario as a powerhouse for the music industry. It shows that a vibrant music scene drives value in many important ways, including job creation, tourism development, brand building and artistic growth. With the new data from this study, we now have the necessary benchmarks to measure and support its growth. Live Music Measures Up allows us to look at live music through a new lens, and to better understand how critical it is to the entire music ecosystem.” says Graham Henderson, President & CEO of Music Canada. Erin Benjamin, Executive Director of Music Canada Live, participated in today’s launch. “Measuring Live Music represents an historic, timely and monumental opportunity; one which will enable us to entrench the true value of the live music economy in the minds of our stakeholders, government and audiences alike. It’s inspiring to see the sector organize, work together and build on the momentum we can all feel – here in the Province and around the world – the kind that will help guarantee live music takes its rightful place as one of Ontario’s greatest natural resources,” says Benjamin. Prior to this study, there existed no comprehensive data set on Ontario’s live music industry. Music Canada engaged Nordicity to complete the profile, which they did after conducting interviews and surveys of artist managers, promoters, agents, music venues, and festivals in the province. The study was completed in partnership with Ontario’s Ministry of Tourism, Culture and Sport, and with the financial support of the Ontario Media Development Corporation through the Ontario Music Fund. In 2012, Music Canada studied the economic impact of the sound recording industry in Canada utilizing 2010 Statistics Canada data. 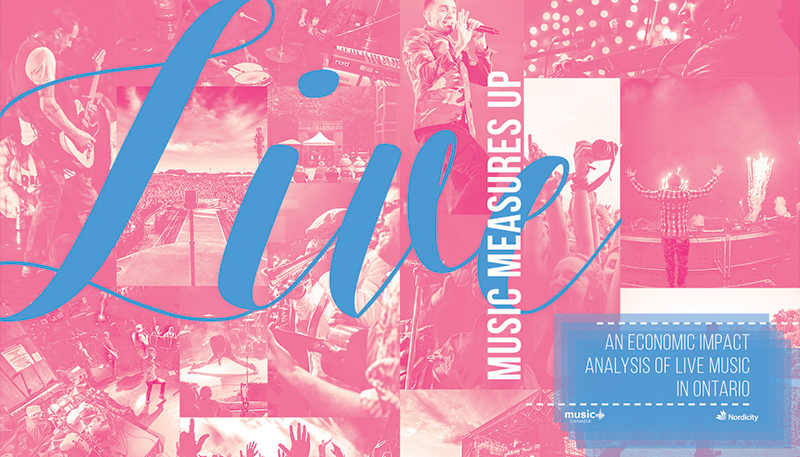 The new data collected for Live Music Measures Up provides a more fulsome and detailed look at the live music sector in Ontario. A more comprehensive data set is necessary to understanding where the live music sector is, has been, and will be in the future. This report will provide necessary benchmarks to understand and support the sector’s future growth. Revenue: Live music companies in Ontario generated $628 million in revenue from live music activities in 2013 as well as profits of $144 million. Artist management revenue from Canadian artists totalled $34 million in 2013, 54 percent of all artist management revenue, and Canadian artists generated $75 million in ticket sales. Audience: In 2013, 558 festivals across Ontario sold a total of 15.7 million tickets, representing 7 million unique visitors. Ontario’s 616 venues have a combined capacity of 3.6 million. The 775 promoters operating in the province in 2013 promoted 81,600 shows, which sold a combined total of 5.4 million tickets. Economic Impact: The total economic impact of live music in Ontario’s economy is $1.2 billion. Live music companies in Ontario were responsible for $484 million in total expenditure in 2013 and contributed $432.4 million in taxes to all levels of government combined. The economic impact of live music companies includes 10,500 full-time equivalent jobs, and tourism activity accounts for an additional 9,520. Future Outlook: Survey respondents reported that access to tax credits and other forms of government funding, along with the availability of local Canadian talent, were the factors that most positively impacted their company growth. And 83 percent of live music companies in the province expect revenue growth within the next two years. “Live music is a powerful force, and we thank Music Canada for their leadership in helping to quantify the extraordinary work of the sector,” adds Benjamin. Pour obtenir une copie de notre communiqué en français, télécharger ici.